امروزه اعتبار سنجی نتایج حاصل از تحلیل­‌های مکانی GIS، تبدیل به یک چالش بزرگ در دنیای GIS شده­ است. 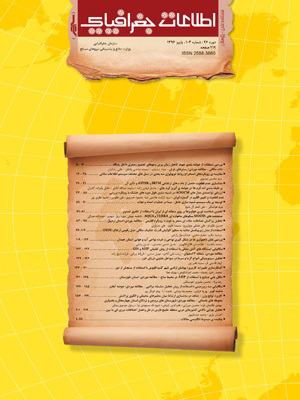 تحلیل عدم قطعیت در زمینه‌­های مختلف توجه به کیفیت داده­ و موضوعات مرتبط با آن از قبیل خطا، مدل­‌های عدم قطعیت، انتشار خطا، حذف خطا و عدم قطعیت در داده‌­ها، بیش از هر زمان دیگر احساس می­‌‌شود. مدل­‌های ارتفاع ­رقومی از مهمترین داده‌­های جغرافیایی می‌­باشند که مبنای تحلیل­‌های مکانی مختلفی را تشکیل می‌دهند. این پژوهش با هدف بررسی میزان خطا و عدم ­قطعیت، داده‌های ارتفاعی حاصل از ماهواره‌های SRTM و ASTER را مد نظر قرار داده است.در این راستا، ابتدا با استفاده از شاخص‌­های آماری ME، STD و RMSE مقدار خطای داده‌­های مدل‌­های ارتفاع رقومی شناسایی محاسبه شد. در ادامه عدم قطعیت خطای داده‌­ها با روش مونت کارلو شبیه‌­سازی و الگوی انتشار خطا با روش درونیابی نتایج استخراج شد. نتایج این مرحله نشان می­‌دهد که مدل رقومی استخراج شده از روج استریویی ASTER با وجود داشتن تفکیک مکانی بهتر، مقادیر بالاتری از خطا را شامل می­‌شود و عملاً فاقد جزییات مدل رقومی ارتفاع معادل 30متر است. سپس با حذف الگوی انتشار خطا از مدل­‌های رقومی، DEM ثانویه تولید گردید. با محاسبه مجدد شاخص‌­های توصیف­‌کننده خطا و مقایسه این مقادیر با مقادیر اولیه، نتایج حاکی از آن است که هر دو مدل ارتفاع رقومی بعد از حذف الگوی انتشار خطا دقت بالاتری را از خود نشان می‌­دهند.از شاخص TPI جهت تعیین موقعیت توپوگرافی حوضه­ استفاده شد و حوضه به 6 طبقه تقسیم و میزان خطا در هر یک از طبقات قبل و بعد از شبیه‌­سازی محاسبه گردید. نتایج حاکی از کاهش میزان خطا در تمامی طبقات قبل و بعد از شبیه­‌سازی در هر دو مدل ­ارتفاع ­رقومی است. نتایج حاصل از این تحقیق در خصوص مدلسازی عدم قطعیت داده‌های مدل‌های رقومی ارتفاع به عنوان یکی از داده‌های پایه در مطالعات علوم زمین بسیار کاربردی بوده و می‌تواند راهگشای مطالعات آتی برای کاهش عدم قطعیت و افزایش صحت نتایج تحقیقات آتی باشد. DigitalElevation Model (DEM) is one of the main geographical datamodels which forms the basis of the different spatial analysis. DEM is known as fundamental data for many modelingtasks. Nowadays, the result validation of GIS spatial analysis, hasbecome a major challenge in the world of GIS.Thequality of a DEM is dependent upon a number of interrelatedfactors, including the methods of data acquisition, the nature ofthe input data, and the methods employed in generating the DEMs.Analysis of uncertainty in different fields, due to data qualityand related issues such as error, uncertainty models, error propagation, error elimination and uncertainties in the data, are felt morethan any other times. Of all these factors, data acquisitionis the most critical one. Previous studies on DEM dataacquisition have focused either on examination of generation method(s), oron case studies of accuracy testing. These studies are not adequate,however, for the purpose of understanding uncertainty (an indicator used toapproximate the discrepancy between geographic data and the geographic reality thatthese data intend to represent) associated with DEM data and thepropagation of this uncertainty through GIS based analyses. The developmentof strategies for identifying, quantifying, tracking, reducing, visualizing, and reportinguncertainty in DEM data are called for by the GIS community. In order to apply uncertainty analysis on DEMs, this studyaimed to evaluate the error rate and uncertainty of elevationdata obtained from SRTM and ASTER satellites. The objectives ofthis study are: (1) to understand the sources and reasonsfor uncertainty in DEMs produced by cartographic digitizing; (2) to develop methodsfor quantifying the uncertainty of DEMs using distributional measures and (3) to measure the uncertainty associated with DEMs and minimizethe chances of error by means of optimizing models. Quantifying uncertaintyin DEMs requires comparison of the original elevations (e.g. elevations read from topographic maps) with the elevations in aDEM surface. Such a comparison results in height differences (orresiduals) at the tested points. To analyze the pattern ofdeviation between two sets of elevation data, conventional ways areto yield statistical expressions of the accuracy, such as the rootmean square error, standard deviation, and mean. In fact, allstatistical measures that are effective for describing a frequency distribution, including centraltendency and dispersion measures, may be used, as long asvarious assumptions for specific methods are satisfied. Our research methodology includesseveral steps. The first step was, using the statistical indices ME, STD and RMSE, the error rate of DTMs​​forobtaining the chances of error in ach model. It hasto be mentioned that the main attraction of the RMSElies in its easy computation and straightforward concept. However, this indexis essentially a single global measure of deviations, thus incapable ofaccounting for spatial variation of errors over the interpolated surface. Inorder to obtain more accurate results, then uncertainty of dataerrors was also simulated by Monte Carlo method and errorpropagation pattern was extracted by interpolation of results. The resultsof this step show that, the DEM derived from pairstereo ASTER despite having better spatial resolution, included more errorsand practically lacking the details of DTM 30 meters. Finally,removing the error propagation pattern from DEMs, the secondary DEMwas produced. By recalculating indicators describing the error and comparingthese values with the initial values, the results indicate that,both DEMs show more accuracy after eliminating the error propagationpattern. TPI Index was used to determine the location ofbasin topography and the basin is divided into 6 classesand error rate in each class was calculated before andafter the simulation. The results showed that, the error ratesin all classes before and after the simulation in bothDEMs were reduced. In terms of uncertainty analysis methods forDEMs, results of our research indicated that the RMSE methodsalone is not sufficient for quantifying DEM uncertainty, because this measurerarely addresses the issue of distributional accuracy. To fully understand andquantify the DEM uncertainty, spatial accuracy measures, such as accuracy surfaces, indices for spatial autocorrelation, and variograms, should be used. Results alsoindicated that Monet Carlo simulation is indeed sufficient methods forsimulation error in DEMs. Results of this research are of great importance for uncertainty analysis in domain of Geosciences andcan be used for improving the accuracy of modeling in avariety of applications. 1. Cobb, M., Petry, F. and Robinson, V., 2000, Uncertainty in geographic information systems and spatial data, Fuzzy Sets and Systems, 113, 1. 2. Engler, N., Hall, B. (2007). The Internet, Spatial Data Globalization and Data use : The case of Tibet, The Information Society : An International Journal, 23:5, 345-359. 3. Fisher, P.F., 1991. First experiments in viewshed uncertainty:the accuracy of the viewshed area. PhotogrammetricEngineering and Remote Sensing 57 (10), 1321–1327. 4. Fisher, P.F., 1993. Algorithm and implementation uncertaintyin viewshed analysis. International Journal of GeographicalInformation Systems 7 (4), 331–347. 5. Fisher, P.F. (1998), Improved modelling of elevation error with geostatistic. GeoInformatica 2, 21–33. 6. Fujisada, H., M. Urai, and A. Iwasaki, 2011, Advanced methodology for ASTER DEM generation.IEEE Transactions on Geoscience and Remote Sensing, v. 49, no. 12, p. 5,080-5,091. 7. Hirano, A., Welch, R. and Lang, H. (2003). Mappingfrom ASTER stereo image data: DEM validationand accuracy assessment. ISPRS Journal ofPhotogrammetry & Remote Sensing 57, pp. 356-370. 8. Heuvelink, G.B.M., Burrough, P.A., Leenaers, H., 1990, Errorpropagation in spatial modelling with GIS. Proceedings ofthe First European Conference on Geographical Information Systems, EGIS ’90, Amsterdam, The Netherlands,pp. 453–462. 9. Hunter, G.J. and Goodchild, M.F. )1997(,Modeling the uncertainty of slope and aspectestimates derived from spatial databases.Geographical Analysis 29, 35–49. 10. Kamp, U., Bolch, T. and Olsenholler, J. (2003). DEMgeneration from ASTER satellite data forgeomorphic analysis of Cerro Sillajhuay,Chile/Bolivia. Proc. Of ASPRS AnnualConference, Anchorage, Alaska. 11. May, R., 2001, Risk and uncertainty, Nature, 411, 891. 12. Miller, D.R., Morrice, J.G., 1996. Assessing uncertainty incatchment boundary delimitation. Proceedings of the ThirdInternational Conference/Workshop on Integrating GISand Environmental Modeling, Santa Fe, NM. 13. Oksanen, J., Sarjakoski, T., 2005. Error propagation analysis ofDEM-based drainage basin delineation. International Journal of Remote Sensing, in press. 14. PCI Geomatics, 2001. User’s Guide, version 8.2, 50West Wilmot Street, Richmond Hill, Ontario,Canada. 15. Rosen, P.A., S. Hensley, I.R. Joughin, F.K. Li, S.N. Madsen, E. Rodriguez, R.M. Goldstein, 2000,Synthetic aperture radar interferometry, Proceedings of the IEEE, v. 88, no. 3, p. 333-382. 16. Wechsler, S. P.: Perceptions of Digital Elevation Model Uncertaintyby DEM Users, URISA Journal, 15, 57-64, 2003. 17. Yamaguchi, Y., A.B. Kahle, H. Tsu, T. Kawakami, and M. Pniel, 1998, Overview of AdvancedSpaceborne Thermal Emission and Reflection Radiometer (ASTER). IEEE Transactions onGeoscience and Remote Sensing, v. 36, no. 4, p. 1,062-1,071. 18. Zhang, J. and Goodchild, M.F. )2002(, “Uncertainty in geographical information. Research Monographs in GIS Series”. London: Taylor and Francis.